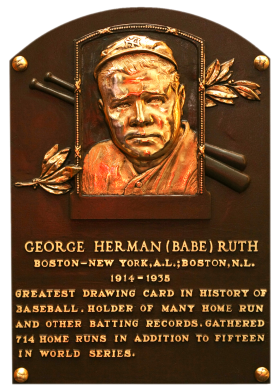 George Herman Ruth is arguably the greatest player of all time. A man of gargantuan appetites and ability, the Babe's mystique has transcended the sport of baseball and has become ingrained in American mythology. Starting his career as a pitcher with Boston, he was one of the best in the A.L. 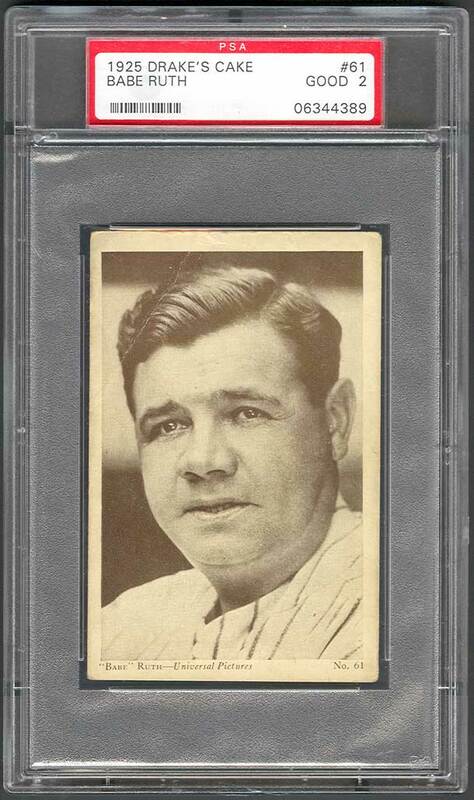 In 1916, the Babe led the AL with a 1.75 ERA while going 23-12. He had 24 wins in '17 with a loop-high 35 complete games. Converted to the outfield part-time in 1918, he led the AL in homers with 11. After he was sold to the Yankees in 1920, he became a full-time flycatcher, and all but invented the home run, slugging 714 for his career, including a then-record of 60 in 1927. He led the AL in homers 12 seasons, RBI six seasons, slugging percentage 13 times, and bases on balls 11 times. He had a career .342 batting average, .690 slugging average, 506 doubles, 2,211 RBI, 2,174 runs, and 2,056 walks. 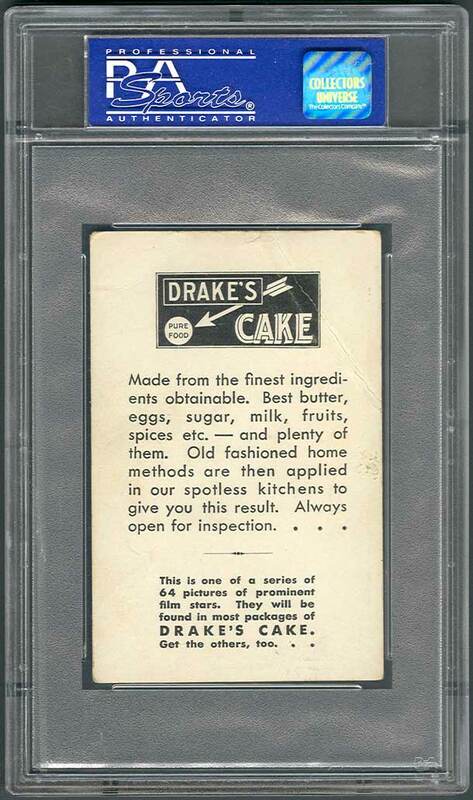 Description: Among a series of 64 movie stars packaged with Drake's Cake in the mid-1920s was a card of Babe Ruth, who did some movie work for Universal Pictures at the time. This series of cards is rarely found in high grade due to their method of issue (one card per package of Drake's "Yankee Cakes") and their thin stock, which is very susceptible to creasing. The 2-7/16" X 4-3/16" black-and-white card has a portrait of Ruth on front, with his name, studio and card number in the bottom border. Backs have an ad for Drake's.